According to comments made on Google+ by Verizon device test engineer Jose Arturo, some unnamed Motorola devices may be getting microSD support and front-facing LED flash. Since the Moto E and Moto G already feature a microSD slot, speculation points to the Moto X as the main device receiving the rumored upgrade. With microSD going out of vogue in certain new Samsung models (ahem...Galaxy S6), Motorola may be looking to capitalize on a function that many Android users have grown to know and love, which is customizable storage. Arturo also indicated the unnamed handsets will feature a front-facing LED flash, which will undoubtedly please the selfie-snapping crowd who have long suffered the scourge of darkness in their self-portraits. The next Moto X is speculated to release near the beginning of fall and is rumored to feature a 5.2 inch Quad HD display, Snapdragon 808 processor, 5 MP front-facing and 16 MP rear-facing camera, and multiple storage options. 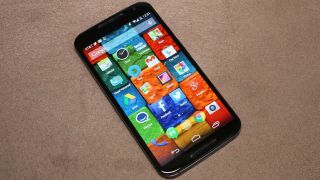 Time will tell which of these rumored features make it aboard the new Moto X. Another bit of news that Arturo posted was the expected arrival of Android 5.1 Lollipop on the Droid Turbo by "mid-June." He also commented on the delays in getting Turbo the update, saying that VoLTE complications are to blame. He also pointed the finger toward a lack of funding in device testing. Remember, Jose Arturo is a device test engineer for Verizon, and not a Motorola spokesperson, so don't start planning out flash-lit selfie ideas just yet. It should also be noted that all of his comments have since been removed, which could indicate that they're accurate...or very not.